USS Harry S. Truman in the Arabian Sea. U.S. Navy photo by Mass Communication Specialist 2nd Class Kilho Park. A version of this article was first published at PROSPECT Blog. “Now consider that in the coming days, there will be a whopping three U.S. aircraft carrier battle groups near Iranian waters at the mouth of the Persian/Arabian Gulf. The Carl Vinson is there to relieve the John C. Stennis, which Iran recently threatened directly and has yet to sail for home. Almost there is the Abraham Lincoln. All these deployments were scheduled long ago. But if you were Iran, would that reassure you? Or would you see three U.S. aircraft carriers near your shores with tensions as high as they are? While open war between US and Iranian forces is certainly possible, it’s unlikely that the Iranian leadership’s incentives scheme favors an escalation into actual combat. What are Iran’s strategic goals? In the short-term, reducing the severity of the crippling economic sanctions imposed by the United States, EU, and UN; in the long-term, achieving regional hegemony at the expense of the US, Israel, and Iran’s Sunni Arab rivals. It’s possible that the Iranian leadership sees threats to close the Strait of Hormuz and shut off 20% of the world’s oil supply as a tool to coerce the rest of the world into moderating sanctions. The Iranian Navy almost certainly lacks the capability to completely close the strait for an extended period of time. 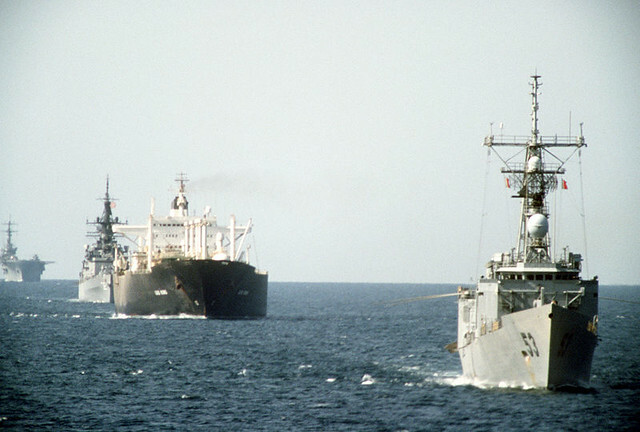 The US Navy demonstrated its ability to forcibly protect tankers in the Persian Gulf from Iranian interference during the Iran-Iraq War, and the US Fifth Fleet’s capabilities have increased since the ‘Tanker War’ of the late 1980s. However, while Iran lacks the capability to completely close the Strait Iranian threats remain credible — asymmetric attacks by the Iranian Revolutionary Guard Corps Navy against tankers and US naval vessels would significantly raise oil prices and massively disrupt the recovering global economy. US Navy vessels protect American-flagged tankers in the Persian Gulf, 1987. US Navy photo. However, it’s an even bet whether Iranian aggression would successfully coerce the international community into dropping sanctions in exchange for a guarantee to keep the strait open. Disrupting the global economy would generate a lot of ill will around the world, especially from energy-hungry states like China that have historically preferred a hands-off approach to Iran diplomacy. Iranian defiance could easily backfire and provoke heightened global appetite for sanctions. This scenario is the more likely of the two. Weakening Iran’s bargaining position is that fact that an Iranian threat to close the strait would be a one-time deal: even relatively successful asymmetric warfare against US forces would destroy military assets — especially surface to air missile systems and Kilo-class diesel submarines — Iran’s status as an international pariah make difficult to replaceable. Of course, there’s a lot of daylight between Iran’s Soviet-legacy S-200 SAM systems and the newer and vastly more capable S-300s the Russians declined to sell to Iran in 2010. But operating in defended Iranian airspace would probably require stealthy B-2s or F-22s, and it’s always possible that the right circumstances could allow and Iranian SAM site to down a US aircraft. Losing a B-2 or F-22 would be a disaster for the US, demonstrating that these advanced aircraft can be downed and destroying much of their valuable mystique. But despite Iranian military capabilities, it’s likely that US and allied Arab forces would force open the strait to shipping before rising oil prices forced an end to sanctions. Asymmetric coercion can only get you so far diplomatically: unlike Hezbollah’s tactical defeat but strategic victory in its 2006 war with Israel, a limited war over the Strait of Hormuz would not be a strategic victory for Iran. The Iranian government’s actions are a balancing act between their short-term and long-term goals. Abandoning the nuclear program and reconciling with the West would bolster Iran’s immediate objective of moderating sanctions, but a nuclear capability is Iran’s best hope at medium-term regional hegemony — Iran can’t credibly challenge the Israelis when Israel has 300 nuclear warheads pointed at them. Iran’s inconsistent diplomatic behavior — what Time’s Joe Klein describes as having “no idea how to play the hand they’ve been dealt because they don’t know very much about the other players at the table” — comes from the fundamental conflict between these short and long-term strategic objectives. Iran knows a war tomorrow would be disastrous. But not acquiring nuclear capability is in the long-term just as bad: it means acquiescing to continued Israeli and Saudi hegemony and Iranian marginalization in the region outside of Iraq, a scenario not improved by the shakiness of Iran’s Syrian ally. Nuclear capability and continued defiance of the West is popular within Iran, and while the Iranian government remains reasonably stable it has a strong popularity incentive to continue its enriching program despite sanctions. Iran’s long-term strategy is to pursue a nuclear capability while straying just shy of the red lines that would lead to war. Increasing the costs of war — building up its SAM and asymmetric naval capabilities, and insisting that it could close the Strait of Hormuz — moves these red lines closer to Iranian goals. We’ve already seen this: President Bush insisted that the US would not allow Iran to enrich uranium, but didn’t act when it passed this milestone in 2006. President Bush rationally concluded that pervious rhetoric aside, a war with Iran to prevent uranium enrichment would fail a cost benefit test. If Iran can continue to raise the costs of war, it can pass additional red lines without consequence. In the immediate term, this is actually a stable equilibrium. Iran knows that attempting to close the Strait or firing on a USN vessel will lead to war — these are serious boundaries that can’t be crossed. Iran has an incentive to threaten the US, but a stronger incentive to avoid a disastrous conflict that would decimate its military capabilities and weaken its long-term strategy. This incentive is strengthened by the recent US withdrawal from Iraq: Iran can no longer deter a US response by threatening to step up covert operations against US troops next door. Usually a strategy that favors escalation to the brink of conflict is dangerous, but here war is unlikely: in the short-term the Iranians clearly understand the US’s firm red lines and are aren’t likely to cross them. In the longer term this equilibrium is less stable. While the Iranian strategy likely seeks to avoid actual conflict, the Israelis have made it clear that they do consider war a more favorable outcome than an Iranian nuclear capability. It’s unlikely that Iranian efforts to raise the cost of war will shift this Israeli trip wire — the Israeli government has spent over a decade insisting that a nuclear Iran is completely unacceptable, and is likely electorally committed to war if an Iranian nuclear weapon appears imminent. This is where Israel’s democracy hurts it. The autocratic Iranian government hasn’t electorally committed itself to following through on its threats to close the Strait. In Israel the stakes are higher, and while Israel’s multi-leg nuclear forces mean it could probably safely accept an inferior Iranian nuclear capability, electoral forces make it difficult for an Israeli government to back down from its insistence that a nuclear Iran is unacceptable. 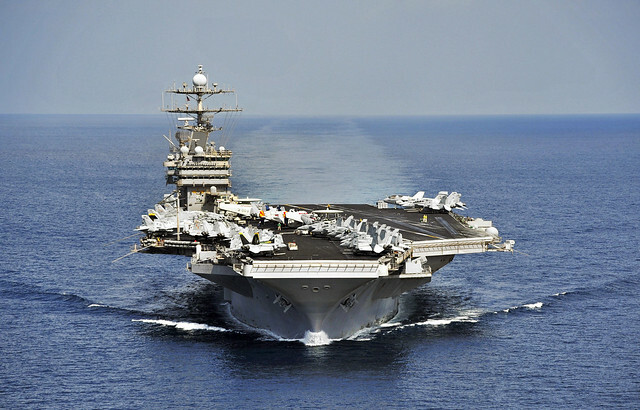 So in the short-term, war is unlikely: the John C. Stennis will safely leave the Gulf, and Iran is unlikely to act on its threat to close the Strait of Hormuz. In the long-term the status quo is less stable. Israel will probably attack Iran before it acquires nuclear capabilities. The Iranian government’s actions are a balancing act between their short-term and long-term goals. Abandoning the nuclear program and reconciling with the West would bolster Iran’s immediate objective of moderating sanctions, but a nuclear capability is Iran’s best hope at medium-term regional hegemony — Iran can’t credibly challenge Israel’s regional dominance when the Israelis have 300 nuclear warheads pointed at them on resilient delivery systems. Iran’s inconsistent diplomatic behavior — what Time’s Joe Klein describes as having “no idea how to play the hand they’ve been dealt because they don’t know very much about the other players at the table” — isn’t indicative that the Iranian leadership’s stupid, but results from the fundamental conflict between these short and long-term strategic objectives. Iran knows a war tomorrow would be disastrous. But not acquiring nuclear capability is in the long-term just as bad: it means acquiescing to continued Israeli and Saudi hegemony and Iranian marginalization in the region outside of Iraq, a scenario not improved by the shakiness of Iran’s Syrian ally. Nuclear capability and continued defiance of the West is popular within Iran, and while the Iranian government remains reasonably stable it has a strong popularity incentive to continue its enriching program despite sanctions. Iran’s rational long-term strategy is to pursue a nuclear capability while straying just shy of the red lines that would lead to war. Increasing the costs of a potential war — building up its SAM and asymmetric naval capabilities, and insisting that it could close the Strait of Hormuz — moves these Western red lines closer to Iranian goals. We’ve already seen this: President Bush insisted that the US would not allow Iran to enrich uranium, but didn’t act when Iran passed this milestone in 2006. The Bush Administration rationally concluded that previous rhetoric aside, a costly and uncertain war to prevent Iranian uranium enrichment wasn’t worth it. If Iran can continue to raise the costs of war, it can likely pass additional US red lines without consequence. In the immediate term, this is actually a stable equilibrium. Iran knows that attempting to close the Strait or firing on a USN vessel will lead to war — these are serious boundaries that can’t be crossed. Iran has an incentive to threaten the US, but stronger reasons to carefully avoid actually escalating to even a limited-scope conflict in the Gulf that would decimate its military capabilities and weaken its long-term strategy. This incentive is strengthened by the recent US withdrawal from Iraq. After the December 2010 US withdrawal, Iran can no longer deter a threatened US military response by threatening to step up covert operations against US troops next door — the US can still strike Iran, but the Revolutionary Guard doesn’t have a credible way to exact revenge. Usually a strategy that favors escalation to the brink of conflict is dangerous, but here war is unlikely: in the short-term the Iranians clearly understand the US’s firm red lines and are aren’t likely to cross them. In the longer term this equilibrium is less stable. While the Iranian strategy likely seeks to avoid actual conflict, the Israelis have repeatedly insisted that they do consider war a more favorable outcome than an Iranian nuclear capability. It’s unlikely that Iranian efforts to raise the cost of war will shift this ultimate Israeli trip wire — Israeli governments have spent over a decade insisting that a nuclear Iran is completely unacceptable, and is likely electorally committed to war if an Iranian nuclear weapon appears imminent. This is where Israel’s democracy hurts it. The autocratic Iranian government hasn’t electorally committed itself to following through on its threats to close the Strait. In Israel the stakes are higher, and while Israel’s multi-leg nuclear forces mean it could probably safely accept an inferior Iranian nuclear capability, electoral pressures make it difficult for an Israeli government to back down from its insistence that a nuclear Iran is unacceptable. So in the short-term, war is unlikely: Iran will probably not act on its threat to close the Strait of Hormuz or move against the US Fifth Fleet. In the long-term the status quo is less stable. It’s then that observers should become truly worried. Excellent article! Though I disagree that Israel has committed itself to attacking Iran before it gets nuclear weapons. True, successive Israeli governments have declared a nuclear Iran “unacceptable” and “an existential threat,” but more recent language from many senior members of Israel’s defense establishment, including the former head of the Mossad, have said Israel can live with a nuclear Iran and have cautioned against a pre-emptive strike. I believe Israel is more interested in jolting the rest of the world into action than preparing its own population for an actual attack.